Jalal ad-Din Muhammad Rumi, also known as Jalal ad-Din Muhammad Balkhi, Mawlana, Mevlana, Mevlevî, and more popularly simply as Rumi was a 13th-century Persian poet, jurist, Islamic scholar, theologian, and Sufi mystic. Rumi's influence transcends national borders and ethnic divisions: Iranians, Tajiks, Turkish, Greeks, Pashtuns, other Central Asian Muslims, and the Muslims of South Asia have greatly appreciated his spiritual legacy for the past seven centuries. His poems have been widely translated into many of the world's languages and transposed into various formats. Rumi has been described as the "most popular poet" and the "best selling Islamic poet" in the United States, among Muslims. Rumi's works are written mostly in Persian, but occasionally he also used Greek, Arabic, and Turkish. Translations of his works are very popular, most notably in Turkey, Azerbaijan, the United States, and South Asia. Rumi was born in a family of learned theologians. Escaping the Mongol invasion and destruction, Rumi and his family traveled extensively in the Muslim lands, performed pilgrimage to Mecca and finally settled in Konya, Anatolia, then part of Seljuk Empire. When his father Bahaduddin Valad passed away, Rumi succeeded his father in 1231 as professor in religious sciences. Rumi 24 years old, was an already accomplished scholar in religious and positive sciences. He was introduced into the mystical path by a wandering dervish, Shamsuddin of Tabriz. His love and his bereavement for the death of Shams found their expression in a surge of music, dance and lyric poems, `Divani Shamsi Tabrizi'. Rumi is the author of six volume didactic epic work, the `Mathnawi', called as the 'Koran in Persian' by Jami, and discourses, `Fihi ma Fihi', written to introduce his disciples into metaphysics. If there is any general idea underlying Rumi's poetry, it is the absolute love of God. His influence on thought, literature and all forms of aesthetic expression in the Islamic world cannot be overrated. 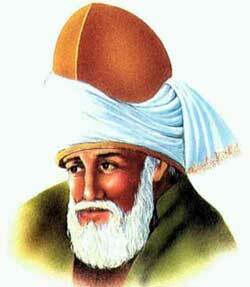 Mevlana Jalaluddin Rumi died on December 17, 1273. Men of five faiths followed his bier. That night was named Sebul Arus (Night of Union). Ever since, the Mawlawi dervishes have kept that date as a festival.